Nightcrawler leads Technet in investigating a series of museum thefts. 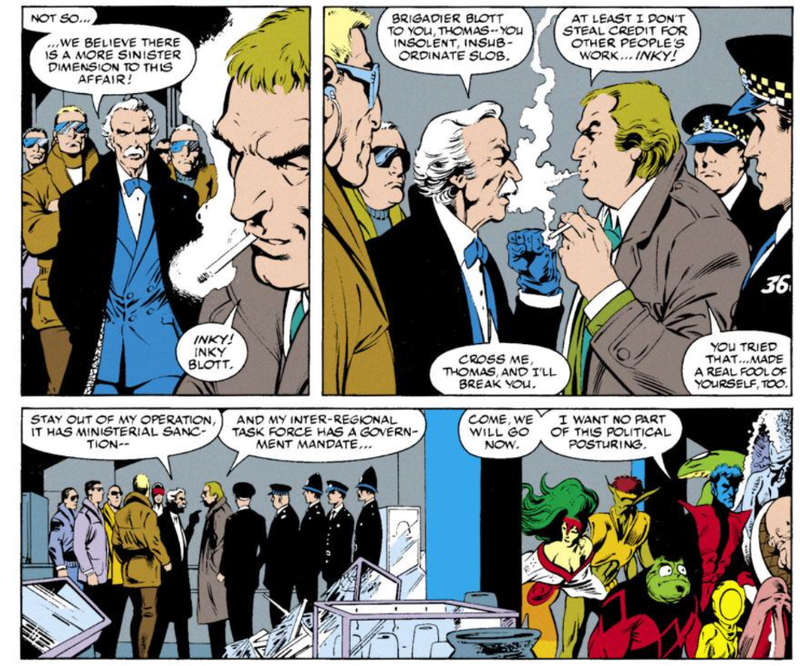 Technet, led by Nightcrawler, stakes out the Major Mainwaring Museum, on a tip from Miss Witherspoon, the clairvoyant friend of Inspector Thomas. They intervene when it appears a theft occurs, but it turns out to be Micromax, also staking out the museum on behalf of F.I. 6. 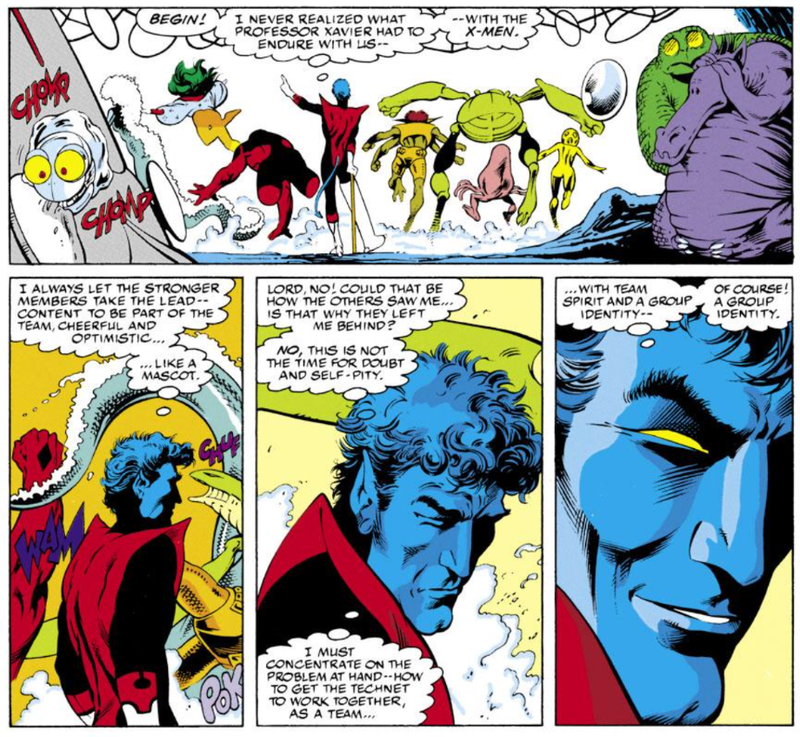 But Technet's showing angers Nightcrawler, who wants them to act more like a team, and realizes he needs to give them a sense of group identity. Meanwhile, on Otherworld, the attack on Brian Braddock is called off on orders from Roma, He then learns more about the nature of his powers and Excalibur's lighthouse from Captain UK. Back on Earth, Rachel and Meggan continue their search for Meggan's parents, while Micromax stakes out another museum. When a necklace is seemingly stolen by an invisible otherdimensional being, Technet intervenes again, this time dressed in matching uniforms and working more like a team, and they manage to defeat the creature and stop the theft, much to the surprise of the creature's master. On Ee'rath, Kylun and Sa'teen reach the throne room of Necrom, the same person orchestrating the thefts on Earth, and he sets a resurrected, zombie-fied Excalibur against them. 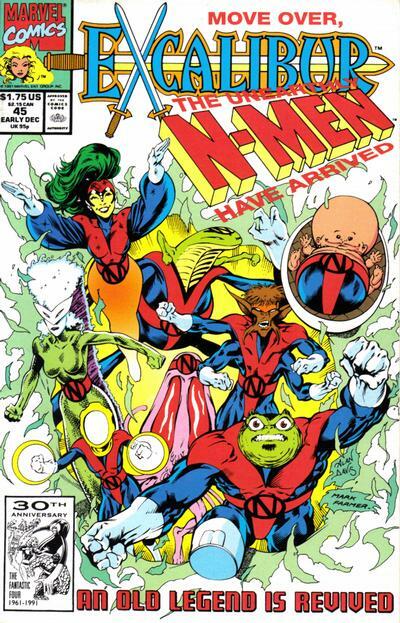 This issue resolves another dangling plot thread, that of the question of Captain Britain's powers fading the further he traveled from England, revealing that all Captain Britain's across the multiverse draw their power from a mystical convergence of energy centered on England, with their costumes designed to store that energy like a battery for their use when away from England for long periods of time. 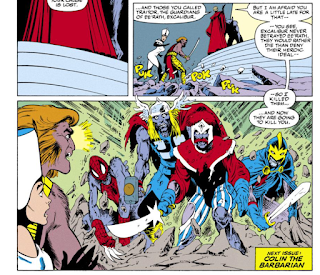 Because Captain Britain's Corp-issued costume was destroyed, he lost that backup system and was eventually rendered powerless after being away from England for too long (this issue also makes it pretty clear Brian is something of a dimwit when it comes to the lore and function of the Captain Britain Corps). 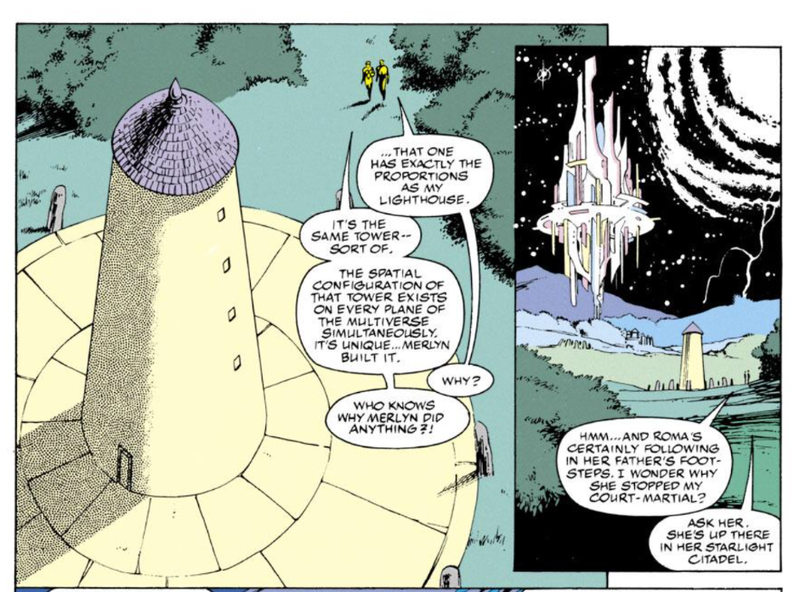 It's also revealed that Excalibur's lighthouse is a nexus point of realities, which explains all the various instances where characters ended up transported into random universes while inside the place. This is the first appearance of Necrom, the tyrant against whom Kylun is leading his rebellion on Ee'rath, and also revealed to be the person behind the mysterious thefts being tracked by F.I. 6 and Nightcrawler's Technet. He serves as the chief villain of the story which culminates in issue #50. 'Inky' Blott, the leader of F.I. 6 (the investigative unit to which Micromax belongs) also appears for the first time. He apparently has a past with Inspector Thomas. 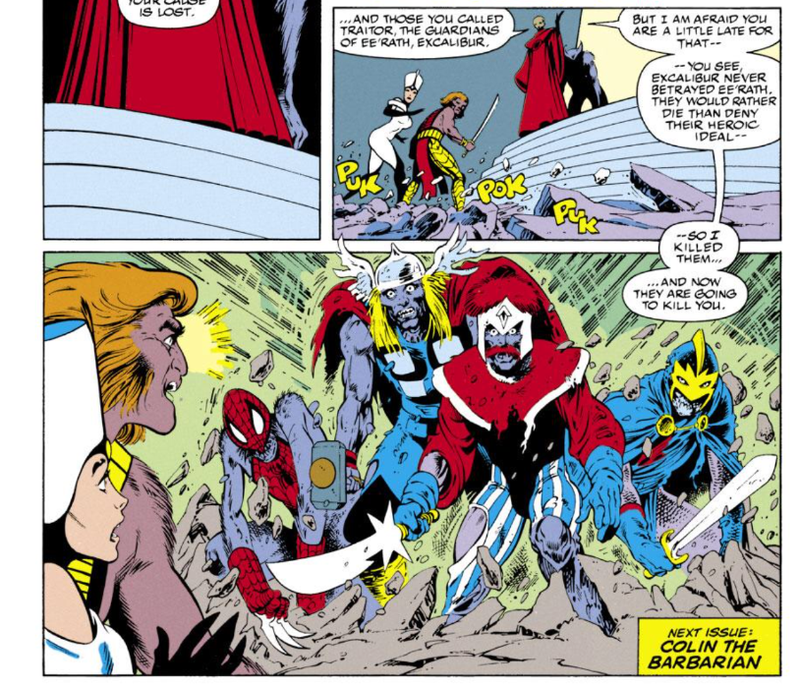 We see the (resurrected) Ee'rath Excalibur this issue, now under the control of Necrom, which consists of Spider-Man, Thor, Black Knight and (presumably) Ee'rath's Captain Britain. 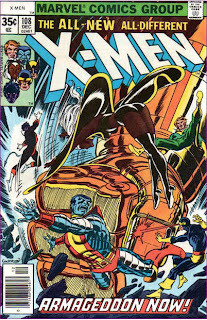 The cover is, of course, an homage to Giant-Size X-Men #1. In the midst of helping train Technet to work as a team, Nightcrawler briefly worries if his former X-Men teammates viewed him simply as the team's mascot. Rachel gives a little more explanation as to the whole "dampening the Phoenix Force" thing she did last issue, explaining that doing so seems to allow her fractured memories to repair themselves to some degree, prompting her to continue doing so. 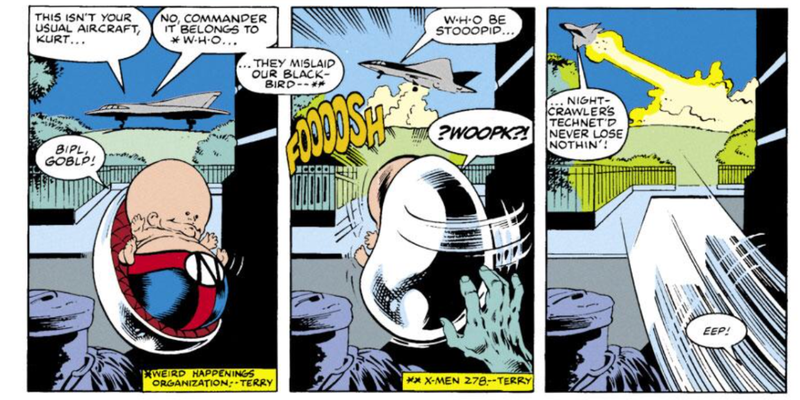 Professor Xavier's re-acquistion of the X-Men's Blackbird from a WHO facility in Uncanny X-Men #278 is acknowledged in this issue. In Captain UK's reality, Madonna is apparently poised to become the next British monarch. One's enjoyment of this issue is likely predicated on how much patience one has for Technet shenanigans. Yet, for as much as that is the A-story of this issue, and for as much fun as it was seeing Nightcrawler realize what a challenge Professor X had in all those years of training X-Men (along with a touch of self-reflection about his role on the team), once again, it's the stuff on the margins of the main story which are the most interesting. Captain Britain getting saved from the horde of angry Captain Britains by Roma is an almost literal deus ex machina resolution to last issue's cliffhanger, but in the process, Davis continues to slyly and subtly tie off dangling plot threads, as the issue of Captain Britain's fading powers from earlier in the series is finally explained and put to rest. 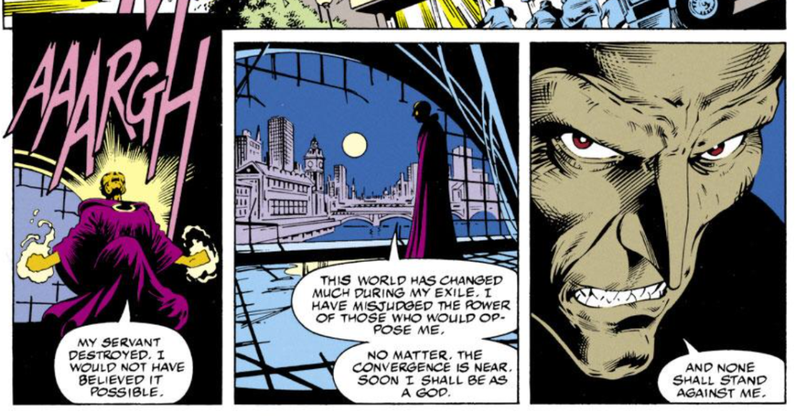 Meanwhile, the Kylun subplot is quickly positioning itself as plot, as the villain of his world is shown to be operating in the 616 universe as well. All together, it highlights what's quickly become a strength of Davis' run: each issue is so jam-packed with stuff, there's bound to something for everyone, such that even if the A-story is less than thrilling, the B-story may work better, and some distant, seemingly-forgotten plot point will probably get explained away, too. And it'll all look gorgeous, regardless. Tomorrow, more dives into Wolverine's past in Wolverine #49. Next week, Uncanny X-Men #284 and X-Force #6. As usual, Davis has a great explanation for the kind of narrative inconsistency that most other writers would shrug off. Why doesn't Rachel just solve every problem with the Phoenix Force, like Professor X used to do? Because she needs to solve the problem established back in Excalibur #1, her fragmented memories. This sets up some narrative tension for the one member of the cast who isn't in some sort of love triangle, and gives Davis more excuses to draw the fabulous civilian clothes he loves instead of an edgy, spiky costume. Captain Mainwaring was the commanding officer of a Home Guard platoon in the town of Walmington-on-Sea in the BBC sitcom Dad's Army. Nice that he got promoted finally. Ha! There's a cultural reference that flew right over my head. 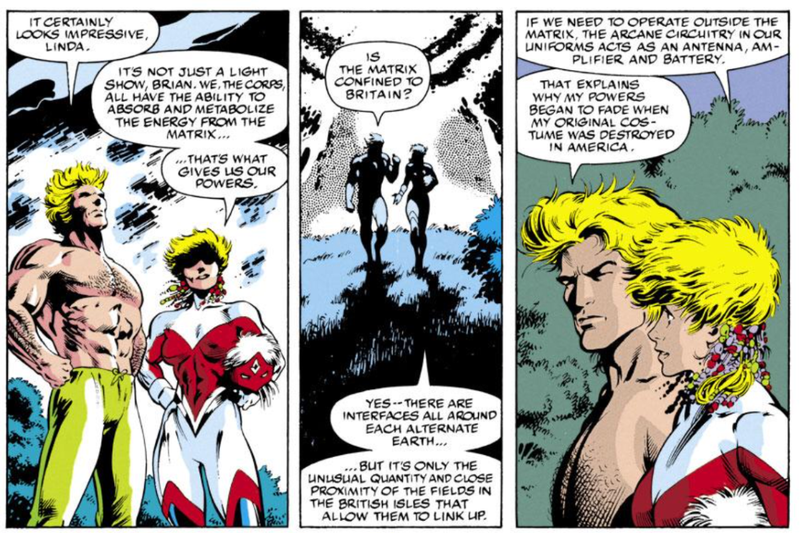 "Because Captain Britain's Corp-issued costume was destroyed, he lost that backup system and was eventually rendered powerless after being away from England for too long"
I get why Alan Davis did this- he needed to explain why Brian didn't weaken when he visited Betsy in X-Men Annual 11 or went to Africa to rescue Jamie- but it just further highlights the problem of why Meggan didn't weaken on those occasions since she was with him. Are the strength of Meggan's powers still tied to her proximity to England? I thought she'd moved past that at some point. Yeah. And I don’t have enough. 8^) Kylun and the CB Corps don’t really thrill me, either; as far as the latter is concerned, it should be up my alley but I’m just not digging it. The pictures are pretty nice, at least, like you say. Even there, however, I’m really turned off by the cover. The white background is a poor choice and, while it wouldn’t help the awkward tilt of the N-Men logo compared to Excalibur’s, the smaller text should be outlined not just for consistency but for readability. It’s a fun touch that Nightcrawler gives them uniforms that are hybrids of his own costume and the X-Men training outfits, though. Kurt dressed them up as Acolytes. I don't think X-MEN #1 had hit the stores yet when this one was drawn so may be an unfortunate coincidence and maybe an editorial failure. 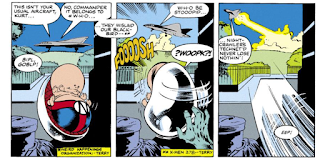 Matt might have the answer to this ... Way back in one of the earliest installments of the Captain Britain serial to be drawn by Alan Davis -- this is one of the ones written by Dave Thorpe (I think maybe the eight or ninth installment of the Thorpe/Davis serial), doesn't the name "Necrom" get dropped? And then just forgotten about? Like Merlin says something about how a certain alternate reality is where "The forces of Necrom have their greatest hold." But then nothing ever comes of that oblique little tease, I guess because Thorpe quit two installments later or so, and Alan Moore took over?